The Proceeds of Crime Bill finally received Royal Assent on Wednesday introducing an agency with the powers to seize cash, property and other assets of suspected criminals. BBC News Online's Chris Summers looks at the Irish model on which the agency is based. When Al Capone was finally jailed in 1931 it was for tax evasion, rather than bootlegging or his role in the St Valentine's Day Massacre. The idea of bringing down a major criminal by scrutinising his accounts is one which has borne fruit again and again. In 1996 the authorities in the Irish Republic used similar tactics to tackle a group of crime lords whose rackets - especially the drug trade - had begun to get out of control. Now the UK is getting its own legislation which, says the government, will enable the "Mr Bigs" of British crime to be brought down to size. The final straw for the Irish state was the murder, in June 1996, of investigative journalist Veronica Guerin. Forced by public outrage to crack down on the "godfathers", the Irish state introduced several laws, one of which enabled them to seize cash, property, luxury cars, yachts and even horses belonging to suspected criminals. Instead of relying on confiscation linked to criminal convictions, they were given the power to target suspects and freeze their assets. If they could prove to a civil court - the civil standard of proof being lower than that in a criminal court - that the assets were bought with the funds of criminal activity then they could seize them. Now the Proceeds of Crime Bill, which has just received Royal Assent, would bring similar powers to bear on criminals in England and Wales. Northern Ireland will also be covered by the legislation and among those targeted there will be paramilitary groups who make money out of fuel and cigarette smuggling, robbery and drug dealing. Because of devolution Scotland will not be covered by the Bill, but the Home Office is hoping to get co-operation from police forces, banks and other institutions north of the border. But civil liberties groups are concerned it will be eroding the age-old British legal principle of "the presumption of innocence". The Bill will set up an Assets Recovery Agency (ARA), modelled on Ireland's Criminal Assets Bureau (CAB), which will be given a target of seizing £60m by 2004/5. The ARA would use similar methods of forensic accounting to follow the money trail. One advantage is that this does not rely on witnesses, who are often intimidated into giving evidence in criminal cases. Instead most of the evidence is based on documentation - or lack of it - which is used to prove that a suspect has made money from crime. Ireland's CAB has recovered millions of euros since its inception and is partially credited with breaking the power of crime bosses, such as John Gilligan, and a fall in the Republic's crime rate. It has frozen 25m euros (£15.8m) under Ireland's Proceeds of Crime legislation and has assessed 61m euros (£38.6m) of assets to be collected under its revenue powers, of which 36m euros (£22.8m) has actually been collected. CAB head Detective Chief Superintendent Felix McKenna told BBC News Online: "We have made life very, very uncomfortable for them." "We seize their assets and younger generations are reluctant to get involved in crime because they see that crime doesn't pay." The architects of the Proceeds of Crime Bill hope it will not only take away the criminals' vast profits but undermine their ability to fund further drug deals or other criminal ventures. 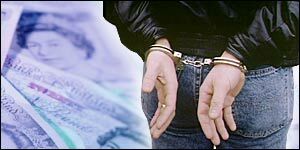 Home Office Minister John Denham said: "Through this bill we can cut into the profits made from crime and increase the risk to those who indulge in criminal activities. But John Wadham, director of the pressure group Liberty, is concerned people will have their homes and bank accounts frozen or seized even though they have not been convicted of a crime. He told BBC News Online: "This bill represents an erosion of the presumption of innocence, which is one of our most fundamental principles. "If it goes ahead, without being considerably amended, we will challenge it in the courts and also in the European Court of Human Rights." "We have taken possession of public houses, boats, brothels and even racehorses"